Long before the launch of his colossal Batman reboot, or original science fiction blockbusters like Inception and Interstellar, director Christopher Nolan made a name for himself with 2000's innovative psychological thriller Memento. Here are a few fascinating facts about the gripping mystery that you might want to jot down before you forget them. 1. THE NOLAN BROTHERS CAME UP WITH THE IDEA WHILE ON A ROAD TRIP. In the summer of 1996, a 26-year-old Christopher Nolan set off from his Chicago home on a 2,000-mile drive toward his new life in Los Angeles with his 20-year-old brother Jonathan along for the ride. In lieu of the license plate game, the Nolan boys passed the time by chatting about potential creative projects, notably Jonathan’s idea for a film about a man with anterograde amnesia. 2. JONATHAN NOLAN PUBLISHED A SHORT STORY VERSION OF THE FILM AFTER ITS RELEASE. Christopher spent the next few months begging Jonathan, who was a student at Georgetown University at the time, to whip up a draft of his idea. Jonathan eventually turned in Memento Mori, which, despite a few major differences, carried the basic backbone of the film that Christopher would eventually write and direct. Since Memento was released internationally in the fall of 2000, several months prior to the 2001 publication of “Memento Mori” in Esquire, the film’s script was eligible for the Best Original Screenplay Oscar at the 74th annual Academy Awards. It was nominated, but lost to Gosford Park. 3. CHRISTOPHER NOLAN ORIGINALLY WANTED A BIGGER STAR FOR THE MAIN ROLE. Before deciding that the relatively unknown Guy Pearce would be more effective (not to mention affordable) in the role of the amnesia-stricken Leonard, Nolan considered some big-name actors like Brad Pitt, Charlie Sheen, and Thomas Jane for the part. Aaron Eckhart, a rising star who would later appear in 2008's The Dark Knight for Nolan, was also in contention for the part. 4. MEMENTO DID NOT TAKE LONG TO MAKE. Despite the intricate script, Memento was a rather breezy production. Shooting wrapped in just 25 days. What’s more, all of Carrie-Ann Moss’s scenes were shot in just eight days. 5. IT DID TAKE A WHILE FOR THE FILM TO FIND A DISTRIBUTOR. 6. NOLAN’S GIRLFRIEND WAS INSTRUMENTAL IN GETTING THE MOVIE OFF THE GROUND. Without a helping hand from Emma Thomas—Nolan’s then-girlfriend, now-wife, and perennial producer—Memento might never have reached the screen. Thomas approached her associate Aaron Ryder, a producer at Newmarket Films, with the script, which won him over instantly. 7. ALL OF THE BLACK-AND-WHITE DIALOGUE WAS IMPROVISED. According to actor Stephen Tobolowsky, the Memento script included zero dialogue for his character, the amnesia-afflicted Sammy Jankis. The actor was asked to improvise throughout the black-and-white flashback scenes that feature his character struggling with his memory impairment (making the line, “Test this, you f*****g quack” a Tobolowsky original). Pearce was also encouraged to improvise during the grayscale sequences in which he narrates Sammy’s story to an unseen listener. 8. JOE PANTOLIANO ALSO INVENTED ELEMENTS FOR HIS CHARACTER. Teddy, Leonard’s ill-fated tagalong played by Joe Pantoliano, seems to have a penchant for the element of surprise, always dropping in on Leonard (and the viewer) unannounced. It was Pantoliano’s idea that Teddy be sitting in Leonard’s car without his knowledge—thus scaring him half to death—in one scene midway through the movie. 9. TOBOLOWSKY ACTUALLY HAD AMNESIA. Tobolowsky is hesitant to credit his talent alone for his mastering the part of Sammy. The actor believes that his personal experience with memory loss gave him an edge. Tobolowsky endured temporary anterograde amnesia following a medical procedure; for a period of time after the procedure, Tobolowsky found himself “waking up” in rooms in his home without any recollection of when or why he entered them. However, his condition was far less severe than that which we see in the movie. 10. NEUROSCIENTISTS LOVE THIS FILM. 11. NOLAN WANTED TO MAKE A NONLINEAR FILM BECAUSE OF A SOCIOLOGICAL THEORY ABOUT PIZZA DELIVERY. 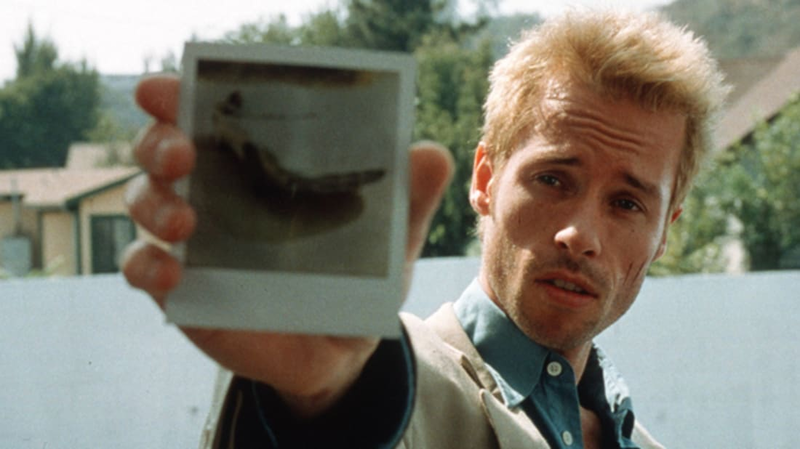 The complicated chronology of Memento was more than just a stylistic preference to Nolan—it was a cultural necessity in a pre-DVR world. With more and more people watching movies on television leading up to Memento’s release, the director felt films were increasingly sacrificing narrative quality in favor of accessibility to viewers opting to leave the room. 12. THE DIRECTOR’S BIGGEST INFLUENCE WASN’T ANOTHER MOVIE, BUT A NOVEL. Nolan has shrugged off the idea that similarly nonlinear films such as Betrayal or Je t'aime, je t'aime played a significant role in his development of Memento, but he readily credits a piece of literature for inspiring his fascination with experimenting with narrative form: the 1983 novel Waterland by Graham Swift, which explores the personal turmoil of a history teacher in Greenwich, England. 13. ONE OF THE MOST IMPORTANT JOBS ON SET WAS GIVEN TO A FARRELLY BROTHERS ALUM. Even with his interesting pedigree, Gehrke nailed the job. He performed so well that he has worked on almost all of Nolan’s films since. 14. NOLAN CHOSE THE MOTEL FEATURED IN THE FILM BASED ON HOW DIFFICULT IT WAS TO NAVIGATE. 15. YOU CAN WATCH THE MOVIE IN CHRONOLOGICAL ORDER (IF YOU PASS THE TEST). The second disc of the 2002 limited edition Memento DVD package rewarded buyers with the option of watching the film in chronological order. In order to unlock this unadvertised feature, however, the user had to solve an interactive puzzle consisting of several memory-based questions.